As Deirdre Clemente shows in this lively history of fashion on American college campuses, whether it's jeans and sneakers or khakis with a polo shirt, chances are college kids made it cool. 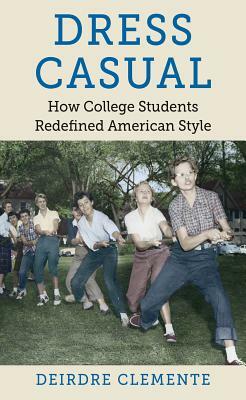 The modern casual American wardrobe, Clemente argues, was born in the classrooms, dormitories, fraternity and sorority houses, and gyms of universities and colleges across the country. As young people gained increasing social and cultural clout during the early twentieth century, their tastes transformed mainstream fashion from collared and corseted to comfortable. From east coast to west and from the Ivy League to historically black colleges and universities, changing styles reflected new ways of defining the value of personal appearance, and, by extension, new possibilities for creating one's identity. The pace of change in fashion options, however, was hardly equal. Race, class, and gender shaped the adoption of casual style, and young women faced particular backlash both from older generations and from their male peers. Nevertheless, as coeds fought dress codes and stereotypes, they joined men in pushing new styles beyond the campus, into dance halls, theaters, homes, and workplaces. Thanks to these shifts, today's casual style provides a middle ground for people of all backgrounds, redefining the meaning of appearance in American culture.